Great ranch plan very open with vaulted ceiling and hardwood floors in entry, living room, kitchen and eating area. Granite counter tops and large island in kitchen with alder wood cabinets and large walk-in pantry. The island has an eating bar and there is a large eating area with bay windows. The kitchen over looks the living room with a floor to ceiling stone fireplace and open stairway to the basement. There are 3 main floor bedrooms all with walk-in closets. 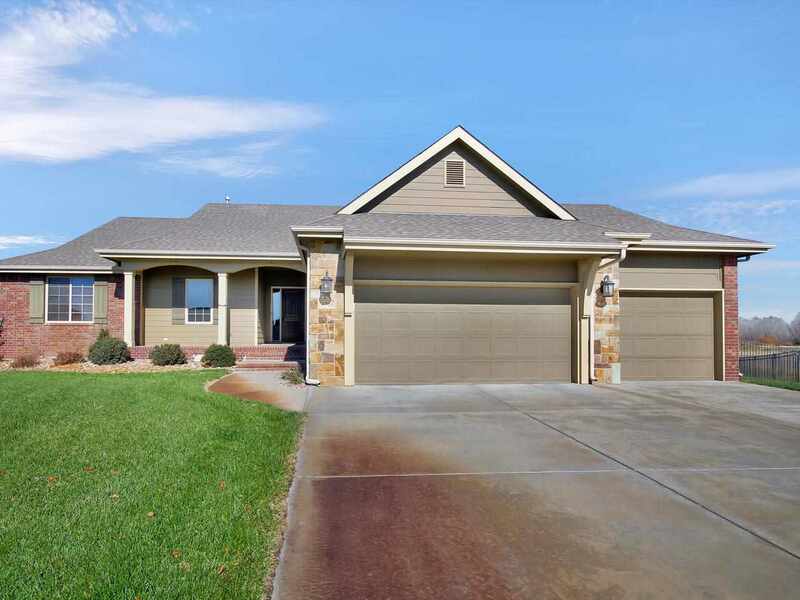 Large master with ceilings and master bathroom has tile floors, 2 sinks with tub and shower, and walk in closet. Full finished walkout basement, open family rec room with a fireplace. Excluded basement TV over fireplace, bracket stays. Large 4th bedroom with walk in closet and a third full bathroom with granite. 2 nice storage areas and a 5th bedroom sheet rocked and electric is all to complete this room. Large backyard with covered deck and patio, a fenced yard with wrought iron fence, well, and sprinkler system. Cul-de-sac lot, Maize schools and 3 car garage. Great neighborhood with pool and club house. Details for maize tax rebate online.